A US court has recently ruled to deprive a lap-dog named Trouble of a big part of its multi-million-dollar fortune. 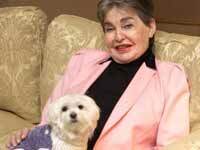 The dog “inherited” the fortune from its owner, a stingy New York billionaire socialite, Leona Helmsley. The court posthumously recognized the woman as a mentally unstable individual and ruled to collect 10 of 12 million dollars from the lap dog in favor of the woman’s grandchildren. The dog’s lawyers intend to appeal against the decision which as they believe violates the dog’s rights. There are special laws in many countries of the world which do not allow a wealthy person to leave his or her fortune to their pet. However, Western lawyers have found an escape clause to avoid the restriction. The testator can simply set up a charity foundation, the only goal of which would be to care for the beloved pet. This is exactly what Trouble’s owner did. The first-ever occurrence of leaving the fortune to an animal took place in Russia in the 19th century. Merchant woman Maria Leontieva from the town of Uglish left more than 100,000 rubles (that was huge money back in those days) to a mongrel dog named Serko. A French baron left 150,000 franks to a Great Dane named as Tiger. The first person who left his fortune to a pet in the USA was Jonathan Jackson, a resident of Columbus. The man ordered to build a hotel for cats with comfortable bedrooms, dining rooms, a library and a concert hall, where cats could enjoy music. It is worthy of note that there are over a million of wills in the USA which mention animals. The world’s richest pet nowadays is a dog named as Gunther IV, a German Shepherd, who has 324 million dollars on its bank account. The dog owns a house, a BMW roadster, a driver, a chef and many servants. The dog inherited the money from another dog – his father, a male dog named as Gunther III. This dog, in his turn, received the fortune from his owner, a German millionaire Karlotta von Liebenstein. Below you can see the list of the richest animals on Earth. 1. Cardinal Richelieu’s 14 cats, which received his entire fortune. 2. Poodle Toby Rice: Millionaire Ella Vendel left her dog $30 million in 1931. 3. A cat named as Tinker found on a landfill inherited a house in London. 4. Singer and musician Freddy Mercury left a lot of his money to his beloved cats. 5. Jean-Paul Belmondo included his Yorkshire Terrier in his will. 6. Labrador Flossy will inherit Drew Barrymore’s 3-million-dollar home. In Russia, there is no law that allows to leave property to a pet. It is only a human being, a natural person or legal entities, who can become heirs. It is possible to indicate that the funds must be spent on cats or dogs, but the money will be transferred to a person who inherits the animal. This person will own and handle the inherited funds or property at his or her discretion and no one will control whether the money is spent on a pet.